A girlfriend gave a challenge to her boyfriend to live a day without her. No communication at all and said if he passed it, she’ll love him forever. The boyfriend agreed. 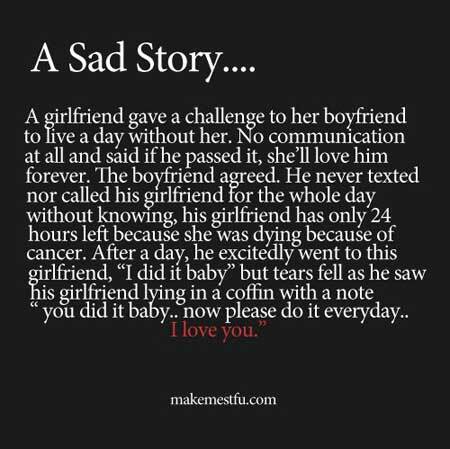 He never texted nor called his girlfriend for the whole day without knowing, his girlfriend has only 24 hours left because she was dying becouse of cancer. After a day, he excitedly went to this girlfriend, ”I did it baby”, but tears fell as he saw his girlfriend lying in a coffin with a note, ”you did it baby.. now please do it everyday.. I love you”. A mature person is one who does not think only in absolutes, who is able to be objective even when deeply stirred emotionally, who has learned that there is both good and bad in all people and all things, and who walks humbly and deals charitably with the circumstances of life, knowing that in this world no one is all-knowing and therefore all of us need both love and charity. There’s not a note of mine that’s worth the noting.